Thomas Le Noir had a sudden a romance bowl him over about six years ago. The initial encounter showed potential, then infatuation blossomed into a true love affair. The serendipitous event was a total surprise to the unsuspecting Le Noir. "I was taking jewelry classes at Instituto Allende, under Billy King, I was always intrigued by stones. Amber is her name and, perhaps to Le Noir's chagrin, the romance didn't burgeon in the usual manner. Amber can't slow dance, nor does she cuddle, she's an inanimate object. Buried below the ground for an incomprehensible span of time, she's now being unearthed by hands and home-made tools. Le Noir remains in awe of the light-weight, petrified resin that was secreted from trees as asp some 26 to 28 million years ago. Although the Baltic region, Dominican Republic and Lebanon are renowned as the water shed of this semi-precious stone, this Mexico City born artist prefers the harder, natural-surfaced Mexican resin to the more plentiful, softer grades mined worldwide. Its rigidness allows for more precise carving, provoking the artist's creative mind to investigate with intricate designs on the translucent, shimmering beauty. Every six weeks or so, San Miguel de Allende based Le Noir ventures off to the southern state of Chiapas to purchase amber in its amber originates. The amber miners are Le Noir's comrades- a group of hand-picked people, like many in the region, who have been farming amber for generations the old-fashioned, brutal way. Because there is no organized effort, the window of opportunity for mining in Mexico takes place only during certain periods of the year. To a degree, Le Noir likes it that way. He respects the life-styles and traditions of the Tzotzil, Tezetzal and Zoque, and he prefers the miners existence isn't an easy one. To feed their families on steady basis they also engage in farmwork, pick coffee for local plations and must refrain from searching for the resin during the rainy season, due to flash flooding and mud slides. It has taken years to cultivate trusting relationships, for both sides. In turn, Le Noir has taken some of the people from the Saemo Jovil region of Chiapas under his wing, schooling them to conceive designs from sketches to reality. Their attention to detail, notes Le Noir, is second to none. A hand-full of people have agreed to relocate to Guanajuato to assist in the San Miguel workshop. 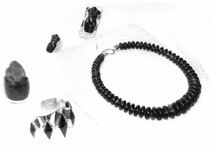 Le Noir designs and finished amber products are mostly one of a kind and stunning to the eye. They range from amber-laden earrings to unique pieces for decoration. Close quartered workmanship has turned a raw, rare resin into exquisite statuesque pieces of art. When the translucent stone is held against the light, the images almost come alive with brilliance. Le Noir's amber as a finished product can not escape a discriminating eye. Le Noir's workshop and studio not only showcase Chiapas amber, but he has impressive samples of green, and even blue amber, both in finished and unfinished form, stemming from various parts of the world. Le Noir says the Baltic amber only becomes hard with chemical treatment. Other than Mexican, only Dominican, blue amber is harder in its natural state. Of additional value for amber collectors are pieces with a spider or praying mantis trapped in the resin, preserved in their eternal-tomb of soft stone, looking as if they were out and about roaming the jungles just yesterday. But, as when any item becomes popular& buyer beware! There are some tricks to the trade. Con men have gotten into the game and one can wrongly purchase wasp or some other creature that may have been scooting around just last week, and then embedded into the center of take amber. The one, sure-shot way to tell if a piece of amber is legit or not is to light a flame to it. A distinct, pine aroma fills the air. Le Noir admits he learns something new each day about his labor of love, acknowledging there is much more to explore. Despite a wealth of knowledge cumulated over a relatively short period of time, the soft-spoken, easy going, man desires to bell all he can be in the field of amber. "I want to know all of its possible applications, from the time it is taken from the earth, until it hangs in a setting from a human ear." The San Miguel artist with Hollywood good looks says he enjoys all aspects of the business. He loves travelling to Chiapas, a mysterious and beautiful place that has become close to his heart. He keeps his ear close to the ground, reads up on mineral discoveries and attends various top-notch gem shows north of the border. He like San Miguel, many visitors make buying pilgrimages and Le Noir's studio is often on those buyers short list. He has clients from Monterrey, Mexico City and as far away as the Orient. Le Noir works out of his studio in San Miguel at Pila Seca #27. A gallery is in the planning, to open this fall on calle Jesus.